Happy Valentine's Day indeed. My Valentine gave me a beautiful card. Still loves me after all these years. I suppose some would say that is cute. 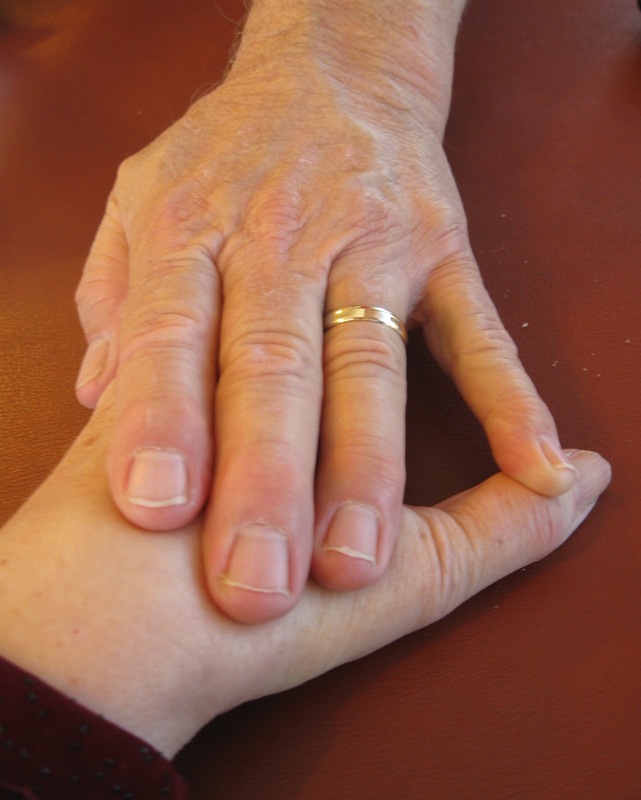 you are blessed to have him holding your hand for therapy and for love. i like the photo. and you are still cute to me. This is the most interesting and uplifting post on hand holding I have ever read! Truly you are so blessed to have Walter, and he to have you. I also just caught up on your bucket post, what a good idea! I am so HAPPY that you are starting to do household chores!!! Way to GO!!! Do you watch The Big Bang Theory? It is our favorite, and I even tape the five repeats on Tuesday and Thursday. We love Sheldon, and I have seen him using the folder many times!! I hate to think what he would have to do without it! Wishing you both a very happy Valentine's Day!! Hi, I came here via Patti's blog and am glad I did. This is a very interesting post about hand holding from a stroke perspective. My hubby has high blood pressure, and I always worry that he will have a stroke one of these days due to his stressful job. I hope you will continue to progress well. Aloha from Hawaii and Happy Valentine's Day! Blessings on your hand exercises and hand holding. You are one Blessed woman Linda. Your sweet Hubby is one in a million. The healing power of touch is so true. Keep on holding hands and being the Cute couple that you really are.